A super simple, super comforting pasta, rich with the flavors of chicken broth and parmesan cheese. Add the chicken stock to a small saucepan and bring just to a boil. As soon as it reaches a boil, add the Israeli couscous (don’t wait as your stock will evaporate and there won’t be enough left to fully cook the couscous). Let stock return to a simmer. Simmer the couscous, stirring occasionally, until the couscous is tender and the chicken stock has been almost completely absorbed, about 7 to 8 minutes. Remove the pan from the heat. 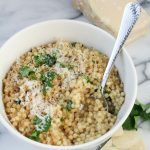 Don’t drain it – the couscous will continue to absorb the stock, and it should have a slightly loose, creamy texture. Add the 3/4 cup of grated parmesan cheese, a generous amount of black pepper, and the chopped parsley. Stir until the cheese has melted into the couscous. Serve immediately, topped with additional parmesan and black pepper if desired.